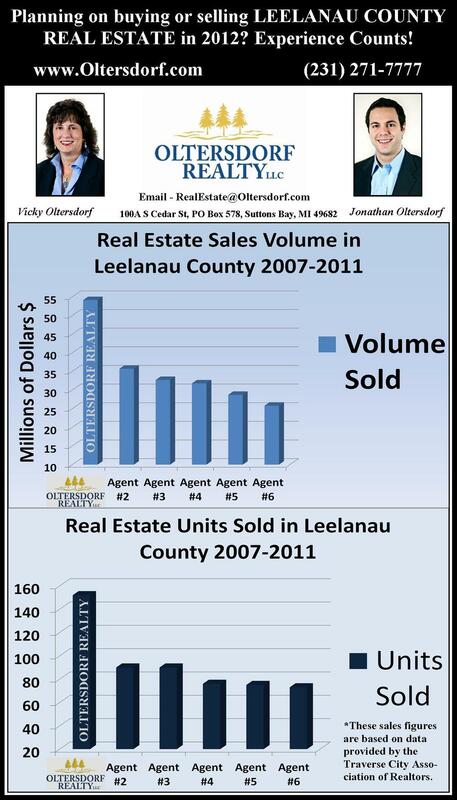 Who sells the most real estate in Leelanau County? Planning on buying or selling Leelanau County real estate in 2012? Experience Counts! Oltersdorf Realty, LLC has sold over $54.7 Million in Sales Volume and 163 Units (homes, vacant parcels, commercial buildings) in Leelanau County from 2007-2011! That’s 35% more volume and 37% more units than the next closest agent! Our client’s listings are advertised through over 50 syndication partners, displaying listings on over 300 websites. In the spring of 2011 we completely rebuilt and modernized our website www.oltersdorf.com which has resulted in an increase of 55% in total visits, 413% in page views, and 182% in average time on the site compared to 2010! We are very pleased with the overall effectiveness of our marketing strategy which has resulted in another productive sales year here at Oltersdorf Realty, LLC. 2011 year end totals resulted in a 10.4% increase in sales volume and a 21.4% increase in total units sold over 2010! We are looking forward to a fantastic 2012!